And connect with each others. We designed to have minimal concrete facilities in camp to basic experience. Spend a day in the outdoor to discover nature and discover yourself. 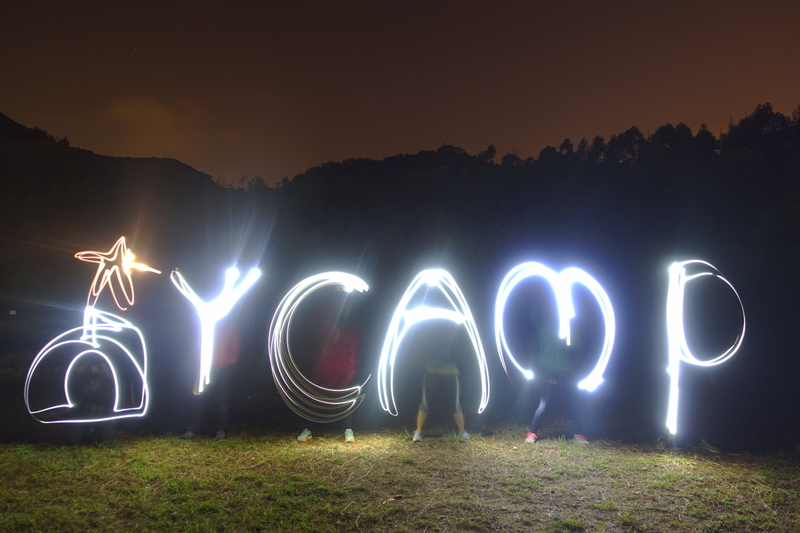 From exciting water activities to star gazing on a quiet night, there are something for everyone to experience in camp. All kids seek the adventure through their curiosity, willingness to learn, and putting their knowledge into action. The YMCA Lamma Island Outdoor Centre gives campers the opportunity to make their own decisions and practice these in hands-on experiences. We provide a structured environment for kids to play outdoors, learn skills of kayaking and archery, learn to build a fire on a cookout, and live in a new community away from home. Managing their daily choices in the safe, caring environment of camp, kids welcome this as a freedom to blossom in new directions. 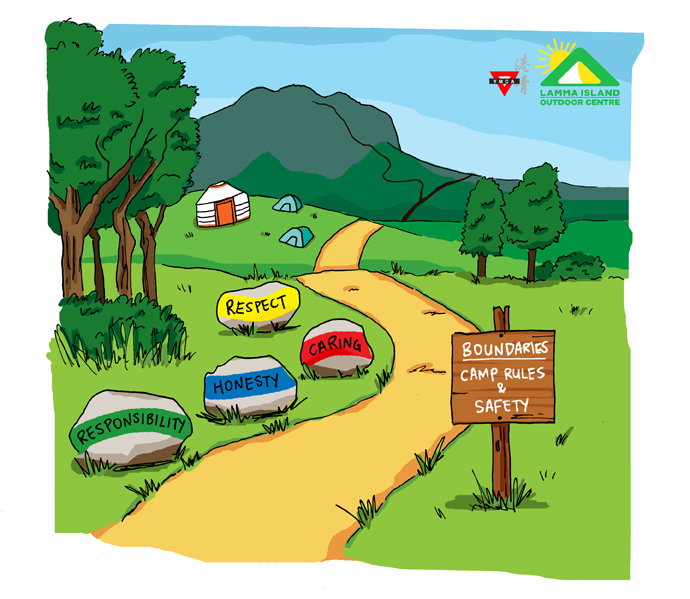 YMCA camp leaders encourage campers to stay on the Leadership Path – between the YMCA Core Values (Honesty, Respect, Caring, and Responsibility) and Boundaries of Camp Rules and Safety. Once children understand the breadth of their decision-making, the Leadership Path can lead them into new territory of building self-esteem, developing friendships and understanding how to contribute to their communities and society. 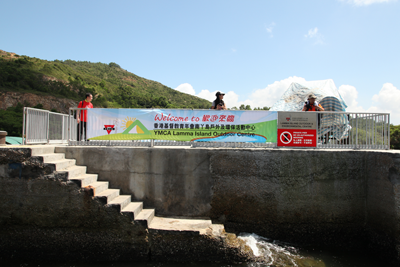 We are located across Sok Kwu Wan on Lamma Island. 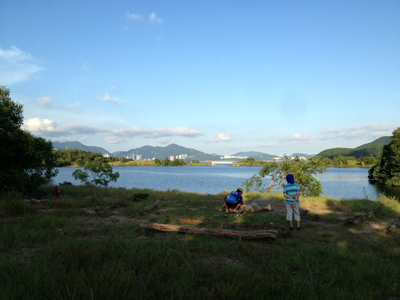 From Sok Kwu Wan Ferry pier, you can wither hike (approx. 1 hour) or take our designated sampan (approx. 2 mins) to our campsite. Our Mongolian yurts are hand-crafted in Mongolia. Each Mongolian yurt contains 4 bunk beds and can sleep up to 8 campers. All yurts are equipped with electricity, air-con/heater, table & chairs, storage, and mattresses. Campers are responsible for bringing their own linen/sleeping bag. The Tent Village is an area where all the tent campers will stay. 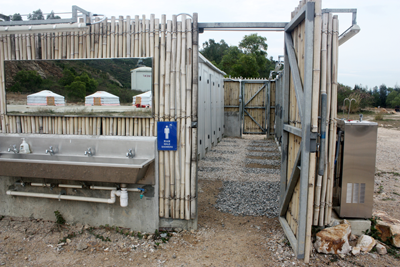 It is a community area with toilets and showers close by. With hot and cold water, the Shower Hut helps make camp feel like home away from home. Located inside the office yurt, we have a well-equipped First Aid Station / Wellness Corner with AED and other emergency medical equipment. Separating our garbage is a good habit. Reuse, Reduce, Recycle. 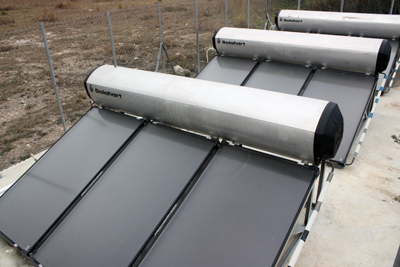 The solar panels at camp help produce hot water for our Shower Hut. To minimize the amount of garbage we produce, we do not have vending machines. We encourage everybody to bring their own water bottle. 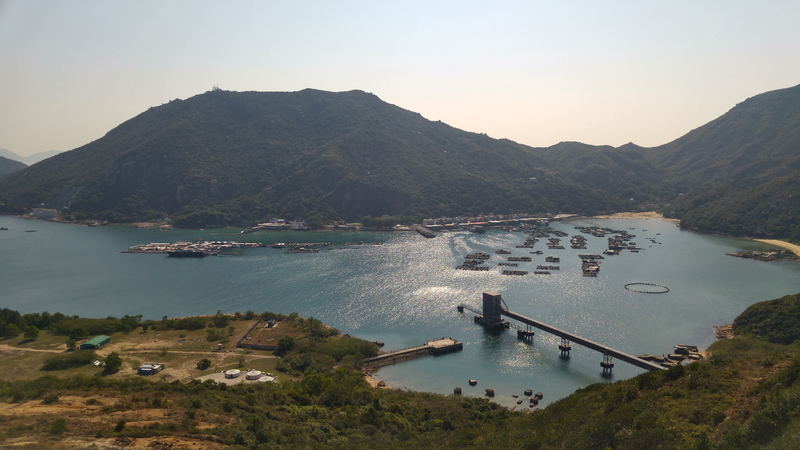 With 43 hectares of outdoor space, the YMCA Lamma Island Outdoor Centre serves as a natural playground hosting a wide range of activities. No matter if you're shooting arrows at the archery range or paddling a kayak at the lake, you are always in touch with nature. Situated in an open area away from other camp programme areas, campers can practice their archery skills in a safe environment. Sing and dance under the starry night sky, next to the lake, with views of Aberdeen, Repulse Bay, and Stanley. Campfire is one of our favorite spots at camp where we can share stories, laugh, and enjoy the beauty of being in a remote area away from light pollution. Campers have the opportunity to explore the different forests of Lamma Island along the hiking trails across the campsite. You will discover the diversity in the pockets of Hong Kong's subtropical forests and see Lamma Island's planation forests and native flora. Bring your camera and you'll enjoy the spectacular view from the top of the mountain. One of the main attractions at our Centre is our 8-hectare fresh water lake. Campers are able to take a swim on a hot day or explore the waters on kayaks. The lake is also shared with other creatures that reside in the area such as egrets, herons, fish, small crayfish, tree frogs, etc. Our playfields are large ,open, multi-purpose space where all the excitement happen. One field is for leisure activities such as picnic, right music and games. Another playfield is for active activities like disc flying, ball games and orienteering course. We are always looking for energetic, passionate, caring, and nature loving. If you are looking for a rewarding part-time job, then we encourage you to apply and become part of this amazing experience! Interested parties should send a full resume and the application form to us.